This was shot at Dal Lake, Srinagar, India which hosts one of the most beautiful and famous houseboats of India. 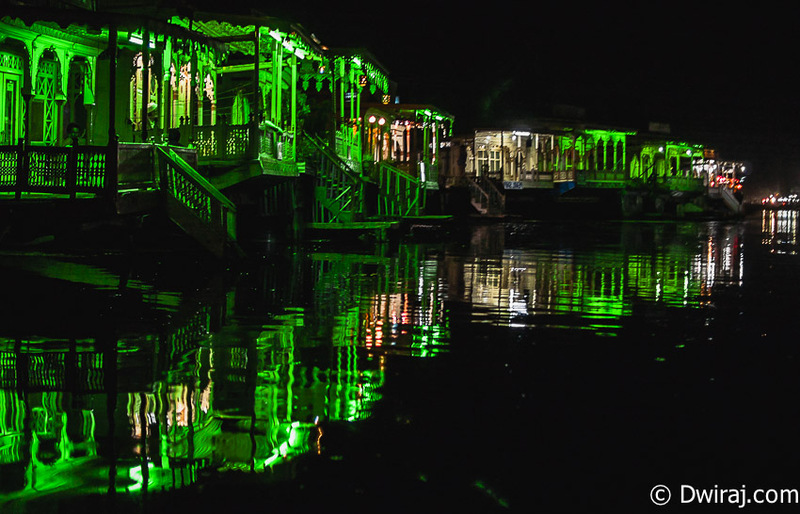 Due to conflicts in Kashmir, it was sad to see many houseboats empty even during peak seasons and I spoke to many owners, some of them were planning to wrap up these beautiful boats as they can’t afford even the maintenance. Leave aside the lake which also seem to be becoming a dump yard (but one of the locals actually told me it is better that it used to be, which sounded encouraging though). There are many locations across the world famous for their houseboats and some of them are: Australia (on the Murray River and the sunny coastline of Victoria), Canada (Quebec, British Columbia & Ontario) and actually, almost many other countries like Germany,New Zealand, Netherlands etc . I went to Hong Kong and couldn’t visit the Aberdeen floating village but I’ll try their next time. In India, other than Kashmir, Kerala (Southern India) is famous for many houseboats along the backwaters. Now a little bit more on the houseboats of Dal Lake (Source Wiki http://en.wikipedia.org/wiki/Dal_Lake#History ): Houseboats and the Dal Lake are widely associated with Srinigar and are nicknamed “floating palaces”, built according to British customs. The houseboats are generally made from local cedar-wood and measure 24–38 metres (79–125 ft) in length and 3–6 metres (9.8–20 ft) in width and are graded in a similar fashion to hotels according to level of comfort. Many of them have lavishly furnished rooms, with verandas and a terrace to serve as a sun-deck or to serve evening cocktails. They are mainly moored along the western periphery of the lake, close to the lakeside boulevard in the vicinity of the Dal gate and on small islands in the lake. They are anchored individually, with interconnecting bridges providing access from one boat to the other. The kitchen-boat is annexed to the main houseboat, which also serves as residence of the boatkeeper and his family. Each houseboat has an exclusive shikara for ferrying guests to the shore. A shikara is small paddled taxi boat, often about 15 feet (4.6 m) long) and made of wood with a canopy and a spade shaped bottom. It is the cultural symbol of Kashmir and is used not only for ferrying visitors but is also used for the vending of fruits, vegetables and flowers and for the fishing and harvesting of aquatic vegetation. All gardens in the lake periphery and houseboats anchored in the lake are approachable through shikaras. The boats are often navigated by two boatmen dressed in “Phiron” (traditional dress) and carry ‘Kangris’ or portable heaters on the boat. A shikara can seat about six people and have heavily cushioned seats and backrests to provide comfort in Mughul style. All houseboat owners provide shikara transport to their house guests free of charge. The shikara is also used to provide for other sightseeing locations in the valley, notably a cruise along the Jhelum River, offering scenic views of the Pir Panjal mountains and passing through the famous seven bridges and the backwaters en route.